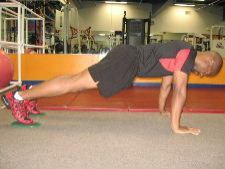 There are many great gliding disc exercises that work your core muscles. This page has pictures of gliding disc knee ins from a plank position. Gliding discs are just another tool that you can use to strengthen your core muscles. Workout discs come in a few different varieties, but they are all very similar to use. 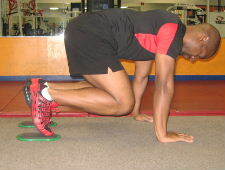 Below are pictures of knee-ins from a plank position using gliding discs. Form: Inhale and slowly bring your knees in towards your chest. Hold, for a brief second and then exhale as your extend your legs back to the starting position. Personal Trainer Tips: When you start in the plank position, make sure that you keep your hands directly underneath your shoulders. This keeps the shoulders in the most stable position. Also, make sure you keep your core muscles engaged as you extend your legs so that your back does not arch excessively. This is a simple exercise that is a more advanced version of the plank, but it's not quite as challenging as knee-ins with a stability ball. 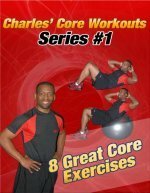 If you are new to core workouts, start with the regular plank and then try more variations once you master the basic plank.